WASHINGTON, D.C. – A group of Hondurans led by a Jesuit priest pleaded with U.S. lawmakers May 17 to stop military aid to the Central American nation and to allow the country’s citizens living under a particular immigration status in the U.S. to remain here until conditions improve in their native country. “We need you to support them so that they continue living in the United States because their return to our country is dangerous,” said Jesuit Father Ismael Moreno, who traveled with a group of five Hondurans to 10 cities in the United States. They spoke to groups and organizations hoping to garner support for some 57,000 Hondurans benefiting from the Temporary Protection Status program, which the Trump administration said would end in 2020, but also for a bill named after one of Moreno’s friends, a human rights activist killed in 2016 in Honduras. Just outside the U.S. Capitol, Georgia Congressman Henry “Hank” Johnson joined Moreno, popularly known as Father Melo, to speak about the Berta Caceres Act, which would cut U.S. military aid to the present government of Honduras led by President Juan Orlando Hernandez. Estimates put U.S. aid to Honduras targeted for “security” at between $18 million to $22 million in 2015. Many of those gathered have for years questioned whether the U.S. should be giving money to Hernandez and his administration. Though the constitution in Honduras limited its president to serve a one-time, six-year term, Hernandez sought and snatched a second term late last year and began that second term under a cloud of illegitimacy and calls for his resignation that have never stopped. His critics, who include Moreno, have been threatened, jailed or attacked. Hondurans who oppose Hernandez say U.S. taxpayers are paying for their oppression. “Their human rights are being denied and trampled upon by a corrupt government that is sponsored by our own government,” he said. Human rights “don’t mean a thing to this current government in Honduras,” Johnson said. The bill has about 70 co-sponsors and “we will one day get it passed,” he said. “If we change our policies, we will create a safer and more peaceful environment, but it can’t be for the select few, it has to be for all of us,” he said. “We are asking for the freedom of those political prisoners,” he said. Neery Carillo, the sister of Caceres, the woman after whom the the bill is named, also was present to talk about her sister, her work and legacy. The U.S. must do better to help Central Americans, she said, and they would stop fleeing their countries if it weren’t for the violence and corruption the U.S. government helped to create. Moreno called for the U.S. to stop supporting “an illegal and illegitimate” president, and help instead to restore democracy. Public Letter from Austra Bertha Flores López. 1. I want to express my deepest thanks to all of the people, social movement organizations, human rights organizations, representatives of indigenous and afro-descendant peoples, women’s organizations, representatives of different churches, diplomats, teachers’ organizations, youth organizations, LGBT organizations, environmentalist organizations, members of the media, in summary, to all of those who have shown solidarity during this tremendously difficult time that I have had to live through as a result of this violent crime. The same is true, of course, for my grand daughters and my grandson, who had their mother stolen from them in the most horrendous way imaginable, along with all of the other family members who have suffered this irreparable loss. I have painstakingly served my people as a midwife, a mayor, a governor and a congresswoman, roles which allowed me to push for the approval of ILO Convention 169, for the defense of women, of children and of human rights in general. At 83 years of age this crime has hit me hard and I am only able to stay strong thanks to the steadfast solidarity that I have received from you. 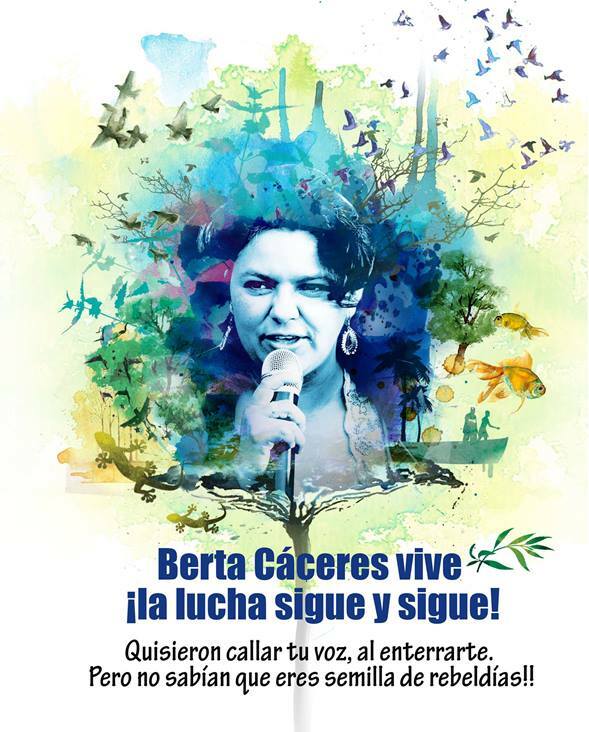 I want to tell you that I hope not to leave this world before achieving justice for my daughter Bertita, who has given her life for our mother earth, for the rights of indigenous and black peoples, for women and for the rivers. For this reason I ask you to please continue to vigorously support me so that we may achieve justice and end impunity in a country so beaten down by the oppressors’ political violence against those who work to build a more just and humane society. I reiterate to you my appreciation, and ask that we make our cries for justice even louder, since that is the only way we can end the impunity that has surrounded this crime. You all can decide on the way to do this, whether through a prayer, a poster, a march, a drawing on a wall, or a non-violent but powerful action. Our sisters and brothers have demonstrated enormous creativity. Keep it up, so that a world without violence can one day be possible. 2. Secondly, I write to you to say that it is the Honduran state that is responsible for this crime, for the following reasons: The Honduran state was under obligation to comply with the protective measures ordered to secure my daughter’s life, yet the state did not fulfill these international commitments. It was the Honduran state that approved the concessions of our natural resources, including the Gualcarque River, a river that is part of the Lenca territory, without the required prior, free, and informed community consultation, despite knowing that it is required to do so under an international agreement approved by the Honduran state. That agreement is the Untied Nations International Labor Organization Convention 169, which mentions the right to consultation. The violation of this convention has generated tremendous conflict, leading to bloodshet in the communities, assassination of indigenous leaders and environmentalists. 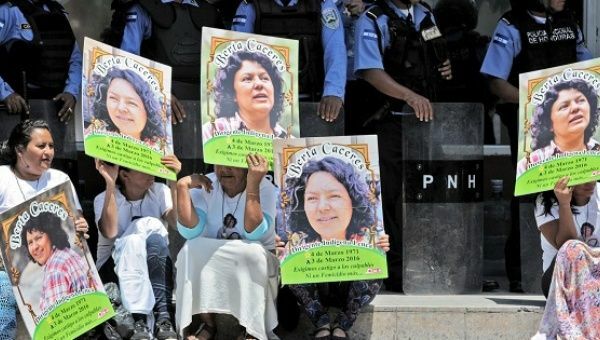 The Honduran state criminalized my daughter by leveraging state institutions to mount several cases against her for the crime of carrying out her work in defense of our natural resources and the rights of indigenous and black peoples in Honduras. The Honduran state has taken it upon itself to defend the private interests of extractive companies, to such an extent that when my daughter, as general coordinator of COPINH, led a march this past February, she was insulted, vilified and threatened by people linked to DESA’s interests in front of the police and the army, whose response was to repress her and the Lena people that were mobilizing, going so far as to seize the buses that were transporting them. 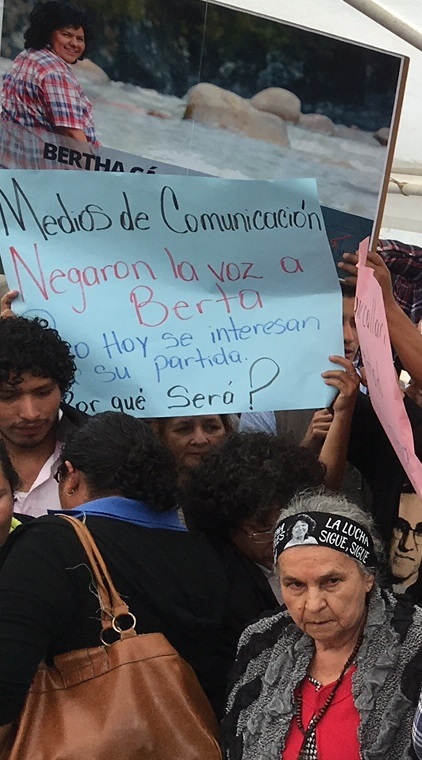 The Honduran state contaminated the crime scene instead of preserving and investigating it. It has been a month already and despite national and international pressure, the state has been unable to capture the material or intellectual authors of this crime that has brought grief to our family and our people. After the coup d’état lists of people to be targeted by death squads for assassination circulated. The first person on those lists was Bertha Isabel. I know that nobody can bring my daughter back to life, but that will not stop my determination to fight with all of my strength so that Bertita’s assassination does not remain in impunity. That means fighting for the Honduran state to allow an independent commission to investigate this painful assassination and to cancel all of the concessions of natural resources that have been handed out in clear violation of ILO Convention 169, particularly the concessions along the Gualcarque River, for which my daughter struggled and continues to struggle from wherever she may be. It means the Honduran government must commit to not allow any more crimes against the women and men who defend human rights. That Honduras allow our family to participate in the investigation. That the Honduran state cease the criminalization of COPINH and the social movement organizations. I would like for UNESCO to designate the Gualcarque River as part of humanity’s cultural and natural heritage. I also want to use this opportunity to express how happy I am that Gustavo Castro, a dear friend and another victim of this crime, has been able to return to his country. in September 2013. As Civilian Deputy to the Commander, he is primarily responsible for overseeing the development and ongoing refinement of USSOUTHCOM regional strategy as well as the Command’s strategic communications, public affairs and human rights activities. 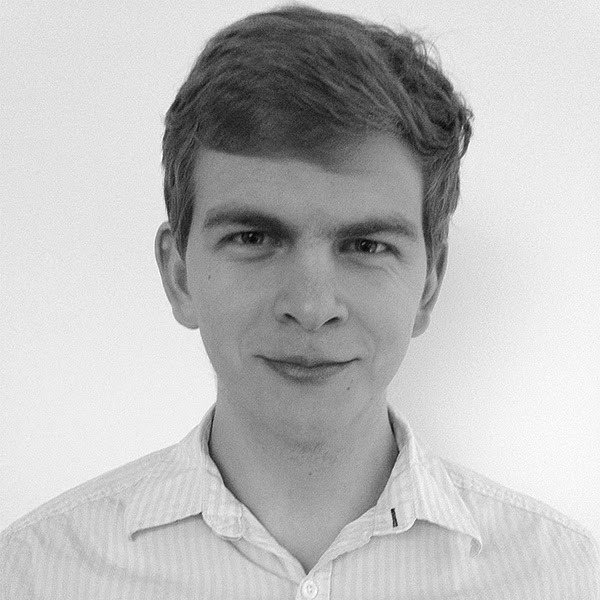 He also plays a key role in interagency and business engagement. As Foreign Policy Advisor, he advises the Commander and other principals on U.S. foreign policy issues linked to the region and supports the Command’s relationship with the Department of State and U.S.Embassies abroad. 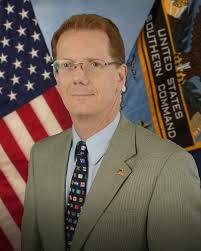 Mr. Nealon came to SOUTHCOM after serving as Deputy Chief of Mission of the U.S. Embassy in Ottawa,Canada (2010-2013). His other assignments include serving as Deputy Chief of Mission in Lima, Peru (2007-2010); Charge d’Affaires and Deputy Chief of Mission in Montevideo, Uruguay (2005-2007); Counselor forPublic Affairs at the Embassies in Madrid, Spain and Budapest, Hungary; Press Attaché at the Embassies inManila, Philippines and Budapest; Cultural Attaché in Montevideo, Uruguay; and Assistant Press Attaché in Santiago, Chile. Mr. Nealon also served at the United States Information Agency’s Bureau of HumanResources in Washington, DC. Mr. Nealon is a career member of the Senior Foreign Service with the rank of Minister-Counselor. He has been awarded the State Department’s Superior Honor Award as well as numerous senior performance awards. A native of Virginia, Mr. Nealon holds a Bachelor of Arts in History from Brown University and completed additional graduate work in history at Boston College. Prior to joining the Foreign Service in 1984, he was a high school history teacher and athletics coach. He speaks Hungarian and Spanish.